"Beginning of the End,” the final episode of Marvel's Agents of S.H.I.E.L.D. on ABC, might have been more aptly named “End of the Beginning.” And thank goodness, because what a long, laborious beginning that was. Throughout a marathon 22 episodes that started back in September, the show endured a ratings slide after a spectacular debut, a lot of grumbling from fans about its listless storyline, and a distinct lack of superheroes. Like, there were practically none. For a show with “Marvel” in the title, you might expect more tights than neckties, but that wasn’t the case at all. Just when it seemed the show would fade into oblivion, Captain America: The Winter Soldier happened. The April movie shook the show to its core when it revealed that S.H.I.E.L.D. had been deeply infiltrated by the evil Hydra. Just like that, Agent Coulson and his ragtag team were relevant again. A month later, on May 8, the show was officially renewed — as was fan interest. Captain America’s takedown of the S.H.I.E.L.D. Helicarriers reverberated for the rest of the season, leading to Tuesday night’s finale that was loaded with the fun, surprising twists and comic book goodies we’ve come to expect from Marvel properties. Here are the most important moments from the show’s most impactful episode yet. Phil Coulson is an avenger! It’s not like “Avenger” is a formal title. It’s been a pretty inclusive club through the years in the comics, with dozens of superheroes cycling in and out — not all with superpowers (current members Black Widow and Hawkeye are just very skilled humans). Coulson is also the new director of S.H.I.E.L.D. … which would be more of an honor if S.H.I.E.L.D. weren’t in tatters. Fury gives Coulson a small cube — a “toolbox,” contents yet unknown — and marching orders to rebuild the organization from scratch. “How should I proceed?” Coulson asks. “That’s up to you … Director,” Fury replies. How does that fit with Fury’s message to Steve Rogers in Winter Soldier, when he says, “Looks like you’re giving the orders now, Cap”? Easy: Rogers is now the leader of The Avengers, Coulson is now the leader of S.H.I.E.L.D. Nick Fury is gonna chill out for a while. Truth is, Jackson has now appeared in six Marvel movies, the standard length of contract for any one actor in the franchise. Though he traded the eye patch and leather trench coat for less conspicuous shades and duds in Winter Soldier (“I’m dressed like I’ve been living under a bridge,” he says in the S.H.I.E.L.D. finale), he’s listed to appear in Avengers: Age of Ultron, and a Nick Fury standalone film has been rumored. We're not holding our breath for that last one, but does that mean Jackson’s time in the MCU run out? Don’t count on it. “You’re going to be disappearing for awhile. Nowhere to be found,” Coulson laments as Fury turns for the door. Simmons now knows Fitz has the feels. Big credit to Iain De Caestecker (Fitz) and Elizabeth Henstridge (Simmons) — these young newcomers had a lot of roles to fill in the first season of S.H.I.E.L.D., whipsawing back and forth between comic relief, MacGyver-inspired deus ex machina, and a heart-tugging love story. Even as the show meandered around in the early goings, they’ve been consistently charming, believable, vulnerable — and at times formidable. They were central to two of the season’s most dramatic moments: One involved falling from an airplane, and the other happened on Tuesday; they're trapped in a sealed pod 90 feet below the surface of the ocean — a quiet and rather touching moment in “Beginning of the End.” After cosmically contemplating the meaning of their imminent deaths, they realize there may be a way out. At a critical point, Fitz seizes the moment to tell Simmons about his feelings for her. “You’re my best friend in the world!” she exclaims as he prepares to sacrifices himself. “You’re more than that, Gemma,” he replies. Fitz goes into season two after surviving the the ordeal — and when he wakes up, he'll have another situation to survive. Because it's out there now. Since these two expert combatants spent the better part of the season secretly sleeping together, you always had to wonder: Who would have the upper hand in a fight? Now we know: They finally came to blows in "Beginning of the End," and Agent May prevailed (not a surprise, really, since she’s seemed like the alpha fighter all along). But before she finally beats him, he nearly gets the best of her: “Reminds me of the old days,” Ward says, straddling his opponent. “You were never on top,” she retorts, before pinning his foot to the floor with a nail gun, then finishing the job. The team heads to its new secret base of operations, only to find it’s being tended by ... Eric Koenig? But wasn’t he killed by Ward a couple of episodes ago? Yes he was, says the new Koenig, telling them he’s “Billy” Koenig, then rattling off the same protocols as his deceased ... twin brother? Fellow clone? We’ll find out in season two. Speaking of season two, one of the primary mysteries from the first season is carrying over: The origins of Skye. The wisecracking super-hacker has found little luck tracking down where she came from, but in the episode’s final shot, we see a photo of her delivered to a man whose hand is dripping in blood (or is that alien goo?). “I found your daughter,” a voice says. Earlier in the episode, Raina taunts Ward about his feelings for Skye, when he suggests that she hates him and thinks he’s a monster. Coulson tried to warn Skye many episodes ago that she might not like what she finds at the end of her quest. And it’s starting to sound like he was right. Last but not least: Marvel's Agents of S.H.I.E.L.D. finally feels ... fun. 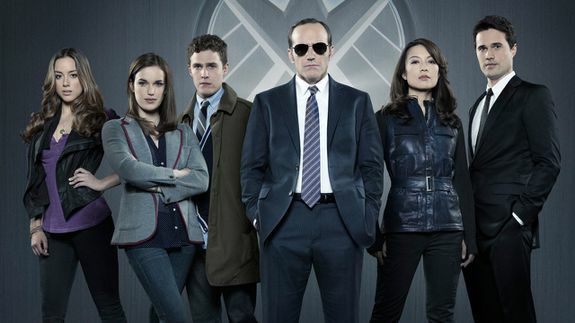 We all expected Marvel’s Agents of S.H.I.E.L.D. to be a natural extension of the films; instead, in the early goings, it defiantly distanced itself from them, as if to establish its own identity on its own merits. But once it got going, it started coyly weaving in references that were more than just name-dropping; the best example yet cae=ne at the season’s climactic boss battle with John Garrett. It was a different story on Tuesday night. “This packs a pretty good punch,” Fury says as Coulson takes the Destroyer weapon. And that's exactly the kind of moment we slogged through 22 episodes to see.